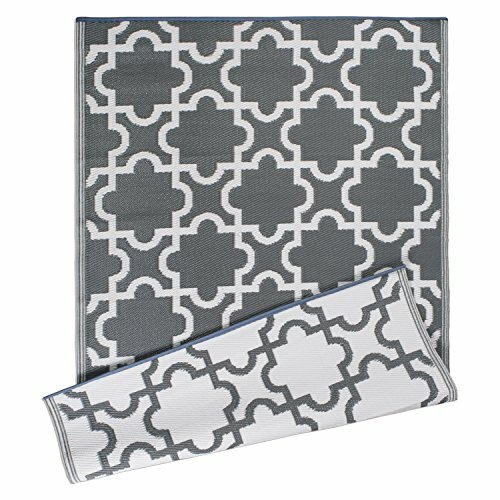 Reversible outdoor rugs come in a pattern that will fit with most décor and are a great way to finish your patio or deck during spring and summer. Material is breathable and won’t harm grass if used temporarily on a lawn for a picnic or barbeque. This would also make a great statement piece when hosting an outdoor event or small family gathering in the backyard. When the season turns cold and wet easily fold or roll to store or use them in a laundry or mud room. Not only are these a great feature outside but can also be incorporated into your home as an area rug for a living space. These are perfect for an apartment or dorm setting for a splash of color, for a fresh look flip over for the reverse pattern. Rugs are made of lightweight100% virgin polypropylene for a beautiful, strong, and hard-wearing surface that is also comfortable underfoot. Mold, mildew, and UV resistant these are made to handle the blazing sun or downpours. Easy to maintain and clean, simply rinse with a hose to clean or sweep away debris. To view our entire selection of our indoor and outdoor rugs options search: DII Rugs or visit our store front by clicking the DII link at the top of the page to explore our other collections. REVERSIBLE OUTDOOR RUGS - DII 4 x 6' rugs are made of 100% virgin polypropylene for a beautiful, strong, and hard-wearing surface that is also comfortable underfoot. MOLD, MILDEW, AND UV RESISTANT - Easy to care for and keep these rugs can weather the hot sun or rain and won't cause damage to your lawn or decking. The Breathable material will not hurt grass or scratch your deck. VERSATILE MATS - Use on your patio in conjunction with your outdoor furniture, rugs are reversable and can give you a fresh look in an instant, you can also easily use these mats in a laundry or mud room during fall and winter. LIGHTWEIGHT AND EASY TO STORE - Rugs are made of a lightweight material that can be rolled or folded for storage during the off-season. We recommend using a non-skid pad beneath the rug (pad not included) to prevent any slipage. QUICK & EASY CLEANING - For a quick clean simply spray with a hose or sweep up debris with a broom. MORE DII OPTIONS FOR YOUR HOME - DII offers delightful products for your entire house including dishtowels, aprons, potholders, ceramics, storage, pet products and more; simply search DII or click the DII link at the top of the page to explore our other collections.